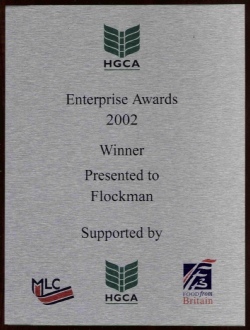 This Enterprise Award was from the Home Grown Cereals Authority. It recognised the contribution that the FLOCKMAN system makes to increasing the proportion of home grown cereals (primarily wheat) in the diet of domestic poultry. This arises because FLOCKMAN recommends the inclusion of WHOLE (unground) cereal into the birds' diet. The effect of this is to stimulate the birds' gizzards to develop fully. This does not happen if birds are fed only normal compound feeds containing only hammer milled ingredients. The fully developed gizzard grinds the whole diet into much smaller particles which present a greater surface area to be exposed to digestive enzymes. The movement of the muscular gizzard also stimulates increased enzyme production. The combined effect is that the birds' digestive system extracts more nutrients from the feed. In particular the protein components of the complete diet are more fully digested so less protein needs to be in the feed to achieve the same growth. This makes extra room for more cereal to be used in the compound feed. This, together with the whole cereal usage, increases the percentage of cereal in the complete diet, which is in line with HGCA objectives. There are additional benefits. Firstly, the cost of feeding the birds is reduced, so increasing poultry farmer's margins. Secondly, less nitrogen and water is excreted thus reducing wastage of resources, which on a world basis are getting scarcer. Thirdly, the welfare of the birds is enhanced due to lower excretion of materials that can adversely affect the health and condition of the birds.